Burtonwood opened in 1940 as No 37 MU, RAF and provided Spitfires for the Battle of Britain before being taken over by the USAAC as its Base Air Depot for the 8th Air Force. Burtonwood grew constantly throughout WWII becoming the largest USAAC base in Europe and responsible for providing over 11,500 aircraft to the US war effort in Europe. This massive base was home to over 18,000 US airmen and airwomen in 1945 and produced anything from a valve spring to a full aircraft. Post war it reverted back to RAF control but with the start of the Cold War it passed back into American hands and was dramatically expanded to be able to accommodate the B-36 bomber and provide support, repair and spares backup for the USAF throughout Europe. Burtonwood broke many records during and after WWII with it being the biggest, best, fastest and most efficient of all bases. Nicknamed Lancashire’s Detroit and visited by everyone from The Duke of Edinburgh, General Montgomery, General Eisenhower, General Patton, Bob Hope, Bing Crosby and James Cagney this base was unique. 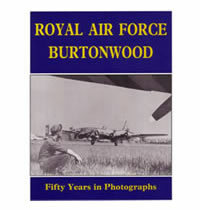 Illustrated by almost 300 photographs this book describes pictorially every activity at Burtonwood. Airfield Publications | Powered by Mantra & WordPress.